Is there a good restaurant in Châteaumeillant? Let Foodle answer your question! 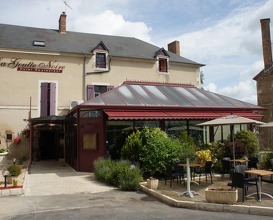 Discover the best restaurants in Châteaumeillant. Gain insight into the most popular restaurants among the Foodle users and find out new inspiring locations. Creative Commons Attribution-NonCommercial-NoDerivatives 4.0 International License. Sign up for our newsletter to get the latest news from Foodle! Discover new dining and food experiences. Join Foodle today!